Kane & Lynch's raw and grimy aesthetic extends to something rarely expected in IO Interactive's sequel—the camera. 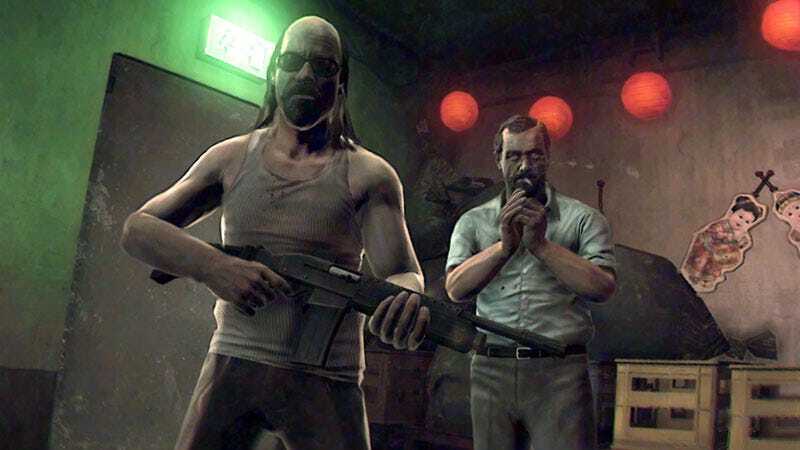 In a game full of unlikable and unattractive characters, Kane & Lynch 2: Dog Days' damaged goods visuals fit right in. After sitting in on a hands-off demonstration of two of Kane & Lynch 2's levels at Square Enix earlier this week, the first thing I mentioned to those who asked about my first look at the game was the camera. It's as much of a star of the show as Messrs. Kane and Lynch, giving the PlayStation 3, Xbox 360 and PC game a constant visual hum, as if it was committed to low quality VHS tape, an adventure available only on a third-generation bootleg. Rarely does a developer strive to make a game look so astoundingly imperfect, one of the facets of Kane & Lynch 2: Dog Days' visuals that makes it so intriguing. The lo-fi presentation is often washed out and grainy, with streaks of light cutting across the screen indicating bright off-screen light sources. There's more to Dog Days' atypically grungy treatment than just style. The screen will pixelate and artifact when the player, as Lynch, takes damage. Particularly gruesome headshots will be obscured by mosaic censors and the "tape" will fall off track and stutter during more explosive moments, adding to the realism of the bootleg quality of the game. There are, of course, other appealing improvements upon and diversions from the original Kane & Lynch: Dead Men that should appeal to fans of the first. Maybe they'll even appeal to followers of the first, ultimately let down by the stylish but flawed action adventure. The most obvious is the switch to the balding, long-haired Lynch as the primary playable character. What that means, in tangibly different gameplay terms from the original Kane & Lynch, may not be immediately noticeable. But the officially described "self-medicated psychopath" will likely make Lynch a more interesting character to assume. More modernized gameplay aspects like the ability to take cover and use blind fire will hopefully make the experience better than the first. The same for the "down not dead" feature, which lets players fire from a downed position after taking excessive damage or lets them crawl prone to better cover. The addition of a cooperative component that's now playable online and an improved "Fragile Alliance" multiplayer mode will surely extend the life Kane & Lynch 2: Dog Days, but it wasn't something we were given the opportunity to experience. Reps on hand noted that IO Interactive was dedicating one team to the single-player/co-op campaign, one purely to "Fragile Alliance." What we did see were two levels, one set in a Chinese restaurant with heavily destructible environments and a textile sweatshop, complete with factory workers wearing hairnets and stationed behind sewing machines who shrieked their alarm at the appearance of a team of fully armed gangsters. The environments in which we saw Kane, Lynch and their group of friendly thugs cavort were appropriately unappealing. The Shanghai of Dog Days that we previewed was all shoddy construction and neon lit alleys, casting sickly green and pink hues on the characters as they walked the trash-filled streets wet with Dumpster juices. It's not pleasant, and appropriately so. And as distasteful as that all sounds, following these lowlife scum and the horrible, violent situations in which they find themselves, there's something interesting about dabbling in the ugly world of Kane & Lynch. Now, the actual gameplay that we saw, that didn't impress quite as much as IO Interactive's visual efforts. The third-person shoot and run action, still in its alpha development stages and based on a December build of the game, looked rougher in a less enticing way. The "down not dead" aspects and improved cover tactics look interesting, if fairly stock stuff, and the technical, not the artistic, aspects of its camera are . Hopefully, we'll get a chance to go hands-on with Kane & Lynch 2: Dog Days before the game arrives in Q2 of this year and that its gunplay will mesmerize as much as its risky visuals.